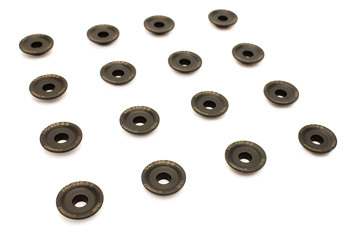 VAC's S14 performance Valve Retainers are engineered for strength and durability. The advantages of using our steel retainers over OEM are due to their lightweight, hardened steel alloy construction. This hardening process makes them strong and resilient while still being lighter than OEM; so if you are daily driving, tracking, or racing they are a great choice. Designed for compatibility with a wide variety of springs including OEM and our VAC springs. Black oxide coated to prevent corrosion. Great for endurance racing, and all street engines. VAC - S14 Shim Under Bucket kit, E30 M3 – For the lightest and highest performance valvetrain. VAC Performance Valve Spring Kit w/Retainers (BMW S14) – VAC Retainers and Springs in one box!